Yesterday, day nine of our Hawaiian holiday, we arrived in Waikiki after five and a half wonderful days at Turtle Bay Resort on O’ahu’s beautiful North Shore. The North Shore is famous for its surfing beaches and laid back “country meets seaside town” sensibility. In the winter months, the North Shore attracts a huge surfing crowd drawn by its big waves and major surfing competitions. But as the year moves towards the northern summer, the waves are more manageable for beginners. Turtle Bay Resort sits on a point between Turtle Bay and Kuilima Cove surrounded by farmland, ranches and the beaches of the North Shore. 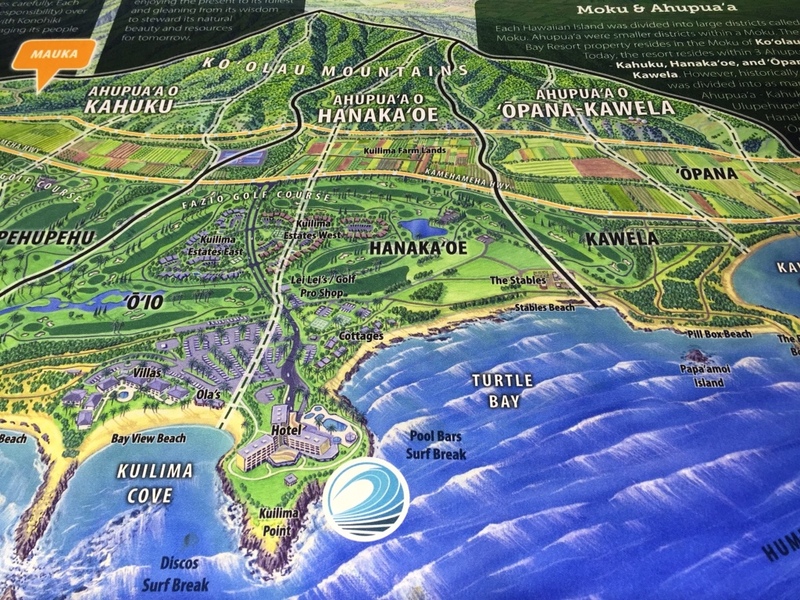 It is the only resort on The North Shore, so is quite secluded compared to, for instance, the resorts of Waikiki. 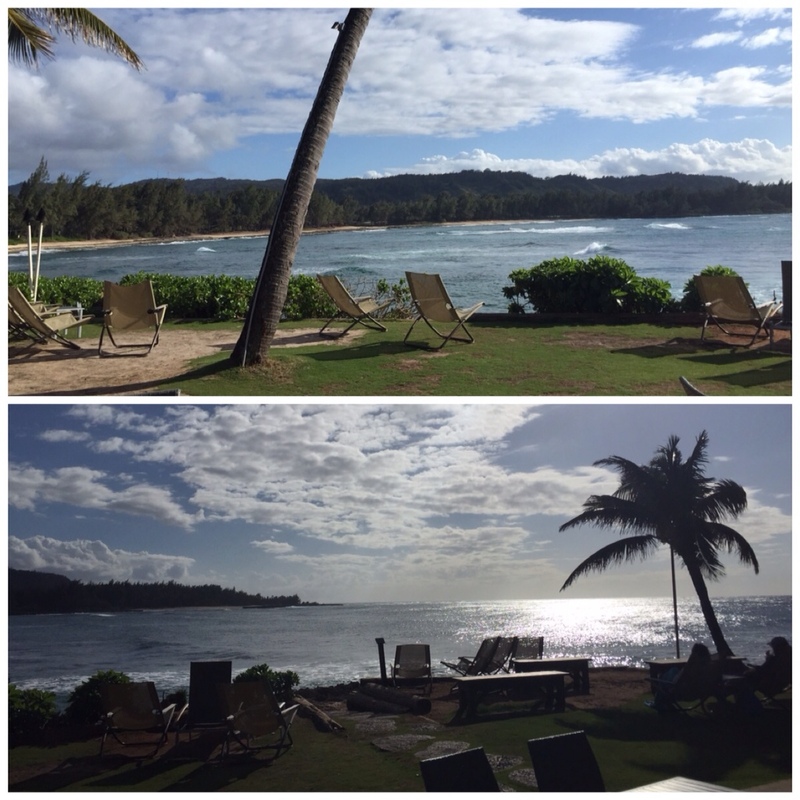 There are some places you visit that suit you perfectly, and Turtle Bay Resort was perfect for us. We loved everything about it. It was not too crowded, quite laid back, offered the exact kinds of activities we wanted, and had comfortable modern rooms and facilities. In Kuilima Cove, on the eastern side of the resort, there is a small sandy beach and gentle bay, divided from the ocean by a reef. 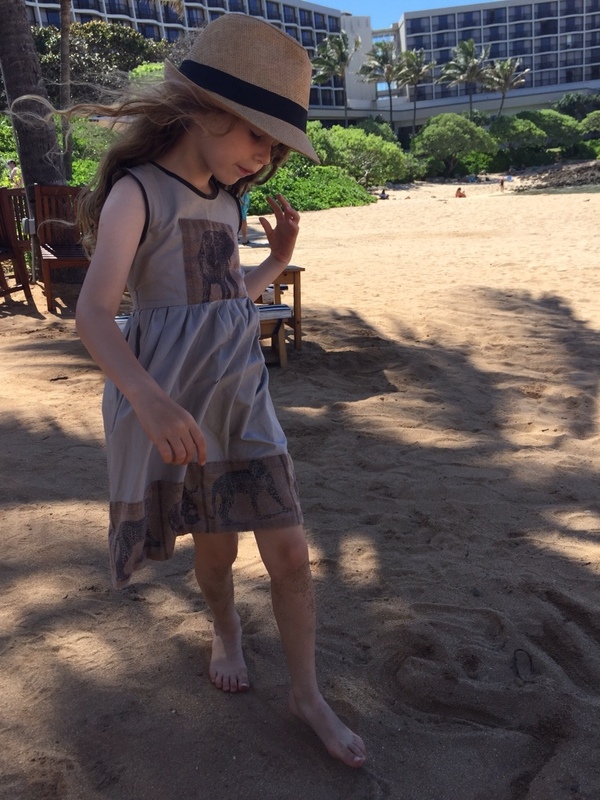 Here we taught Louisa and Oliver how to body surf, Peter and Oliver snorkelled and looked for the turtles that give the bay and resort their name, and the kids played happily in the sand. This side of the resort is quite protected from the strong trade winds that often barrell down the western side of the resort, so the beach — a public beach — offers a peaceful and somewhat warmer spot. On the western side of the resort, we sat near the pool looking out over Turtle Bay and watched surfers take on the break. Closer to shore we again spotted turtles lazily swimming about. Surfing is a huge focus of the North Shore and people often stand on shore right along the coast watching surfers master the waves. A good ride elicits cheers and clapping, even for beginnings. So when Oliver decided to try surfing in Turtle Bay he was in the best spot. 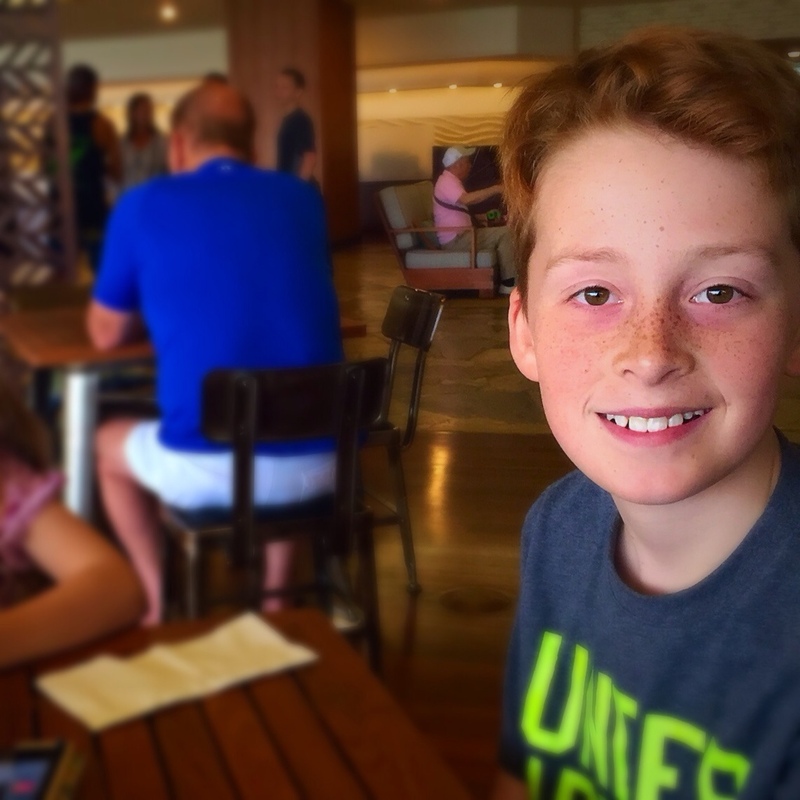 He had a two hour private lesson on both Monday and Tuesday with the Hans Hedemann Surfing School in the resort. After about 15 minutes of quick instruction on land on Monday, he was into the waves with his instructor. When he caught his first wave people on shore cheered and clapped and he pumped his fist into the air. 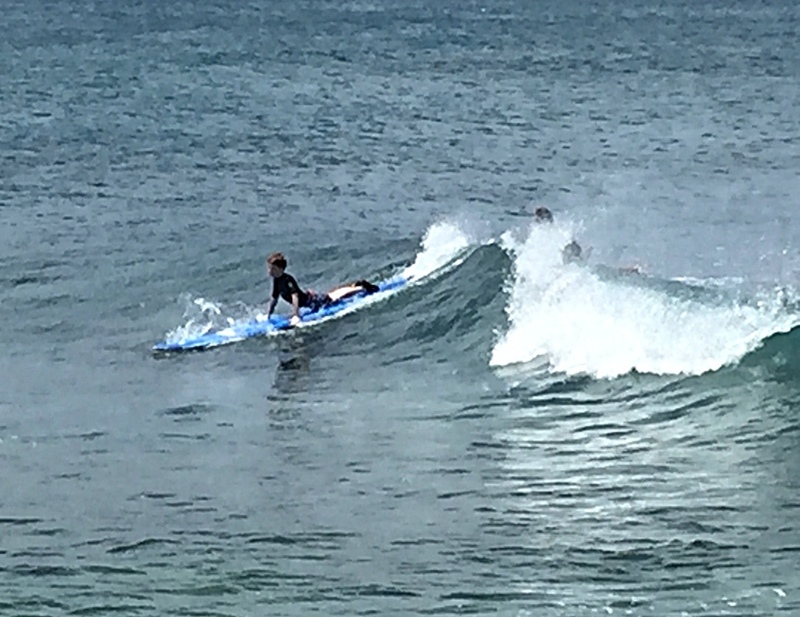 By the end of his first lesson he could pretty reliably catch a wave and stand up. By the end of the second day he was upright so much more that he got a decent sunburn on the back of his legs! 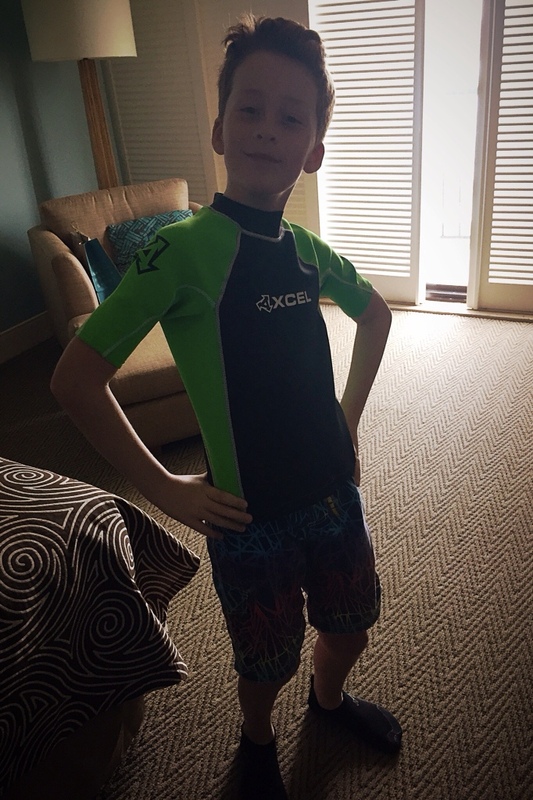 Oliver loved the lessons and loved surfing. On the North Shore, kids 14 years and under must have private lessons for safety reasons. They cost about $150 for two hours (including a cool free surfy t-shirt at the end). Oliver improved so quickly that it seemed a good investment in his fun! 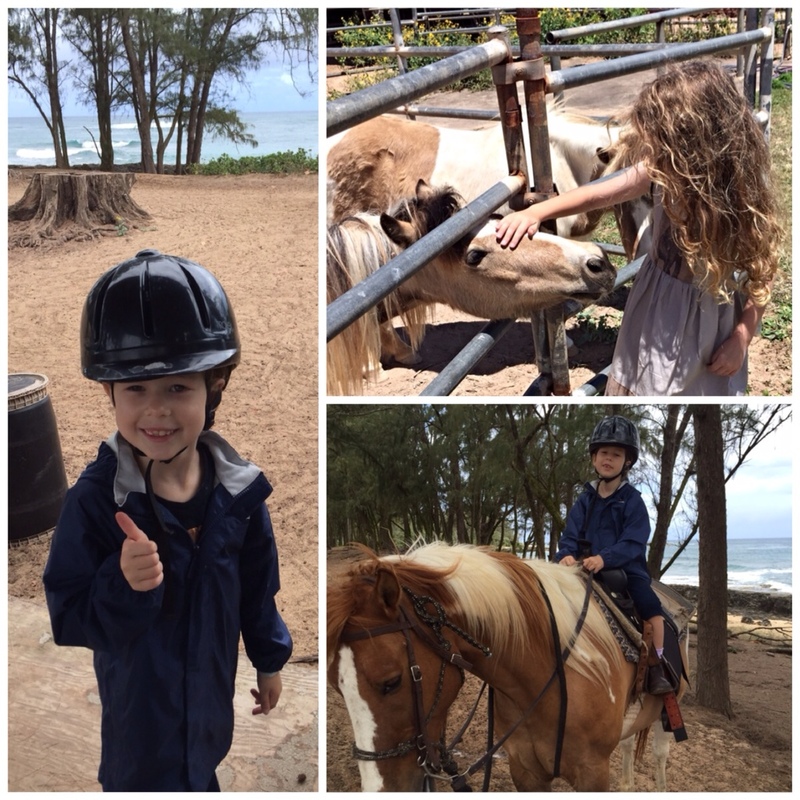 While Oliver was surfing, Louisa was enjoying her favourite pastime: horseriding. 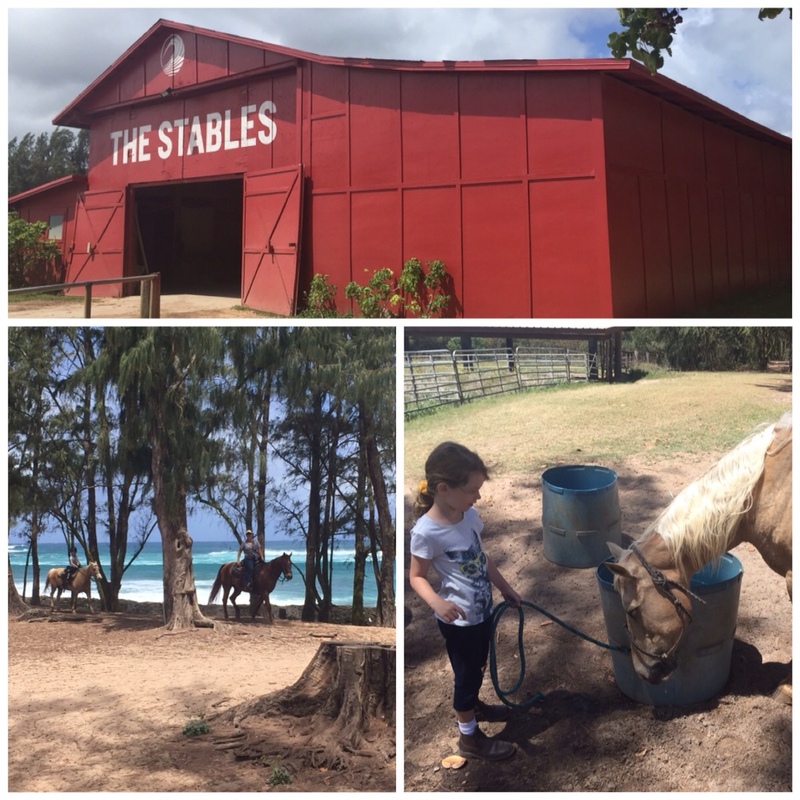 Turtle Bay Resort boasts extensive stables and a range of riding experiences for beginners through to experts. Louisa was younger than the cut off for trail riding (7 years old), so at first she was only offered short 15 minute pony rides on a lead. At home, however, she has weekly riding lessons and is well beyond being walked on a lead. Luckily, the Manager of The Stables, Alicia, kindly allowed me to negotiate a longer, one hour Deluxe Pony Experience that involved helping around The Stables (feeding the horses, turning them out, brushing and washing them, feeding them) as well as riding. We paid $130 an hour for Louisa to do this for an hour each on Monday, Tuesday and Wednesday (compared to $30 for the 15 minute standard Pony Experience). She had a wonderful time with her horses Beetle, Jasper and Goldie as well as the miniature horses, Lilly and Misty. I was grateful that Turtle Bay staff were so willing to accommodate our particular requests and make our stay that much better! When we weren’t surfing or riding or lounging about we were enjoying activities poolside. 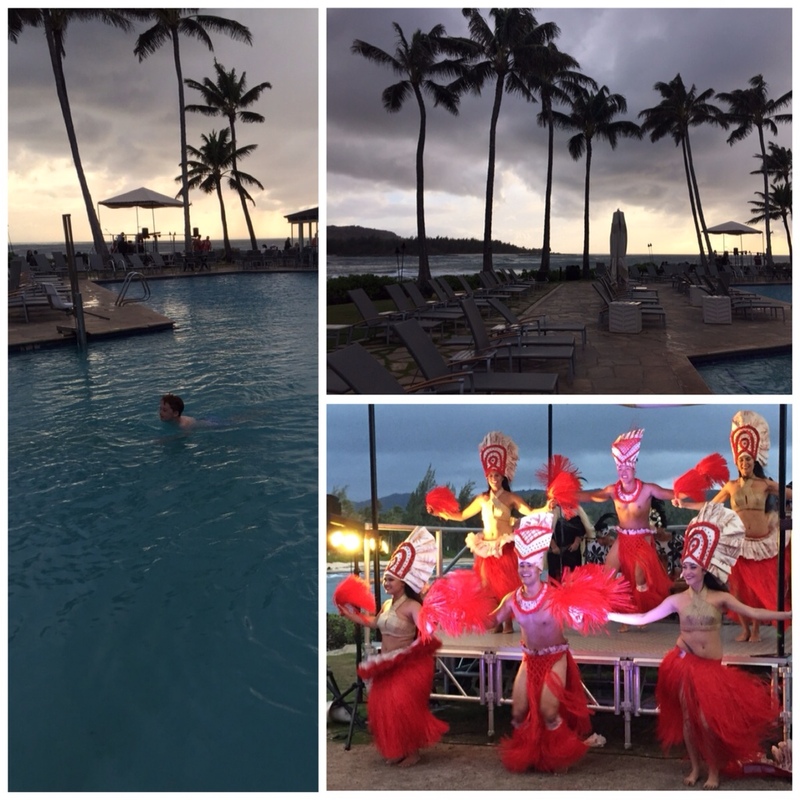 Turtle Bay has four pools: a large heated resort pool, a pool with a water slide, a kids pool and a spa pool. As you can see from the photos, they all had spectacular views of the Pacific Ocean. At night there was music and often a cultural show. 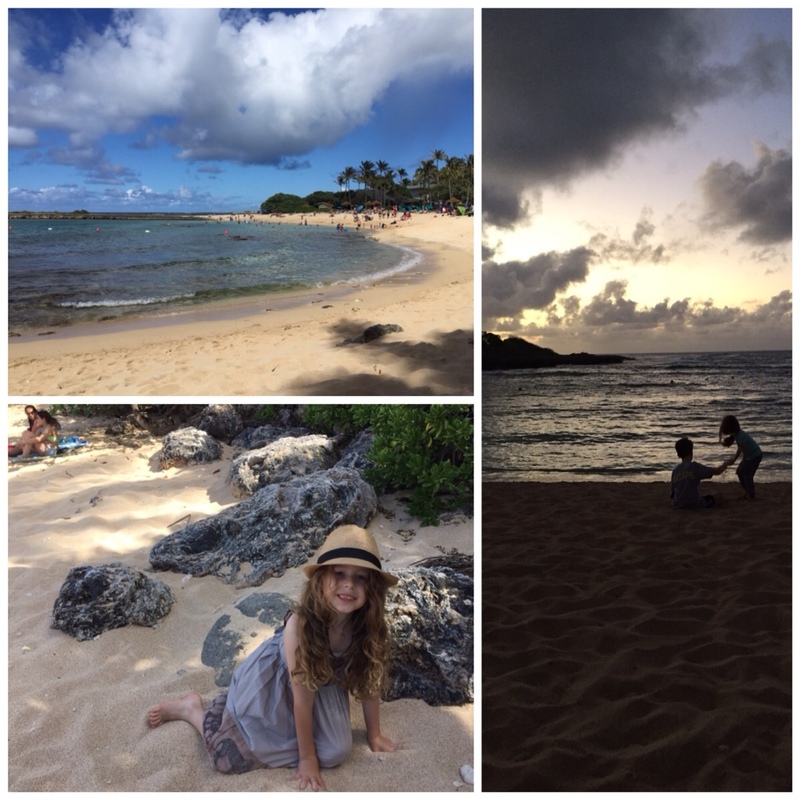 In five days we only scratched the surface of activities at Turtle Bay. Peter and Oliver played a round of soccer golf, which used a soccer ball and modified tees. I visited the Resort Spa for some pampering. And Louisa and I visited the Polynesian Cultural Center. We will post about that visit separately. 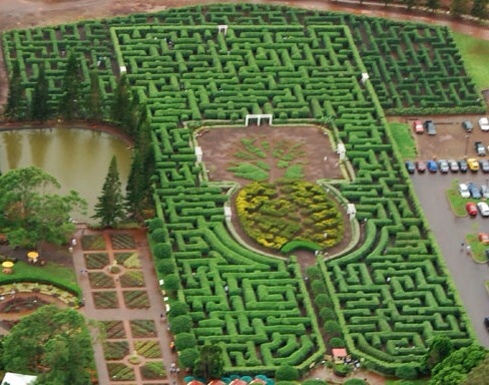 On the drive from Turtle Bay to our final hotel in Waikiki, we stopped into the Dole Pineapple Plantation, home to the world’s largest maze. 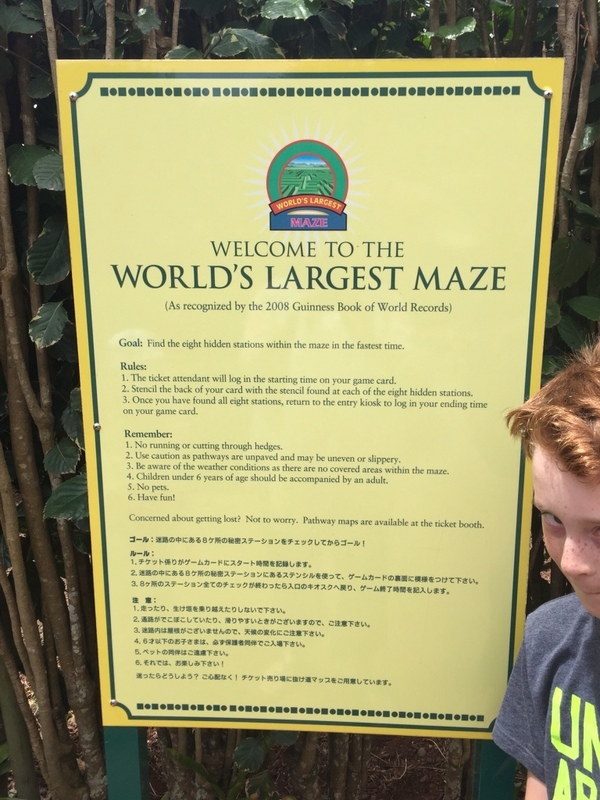 Those who followed our previous adventures may remember that in Cape Town, South Africa, we visited the world’s 3rd largest maze; so just the 2nd largest to go. It took Peter and Louisa about 40 minutes to conquer the maze, while Oliver and I sat in the shade and ate pineapple! 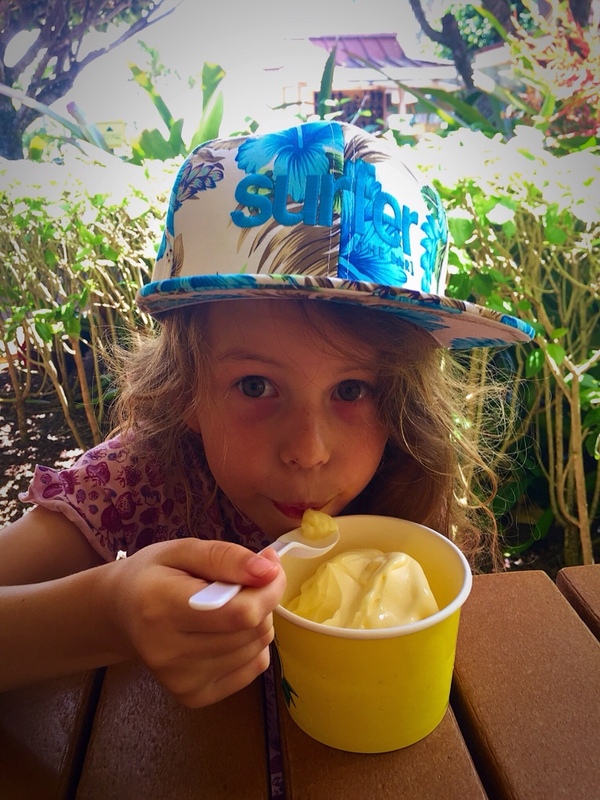 Louisa’s reward was some pineapple icecream. Again, we only scratched the surface of things to see and do around the North Shore, which will have to wait until our next visit. Today is our last day in Waikiki. Before we fly home tomorrow we will tell you about our visit to the Polynesian Cultural Center and swimming with dolphins. We also can’t leave before telling you how happy we were in Turtle Bay. We plan to come back! 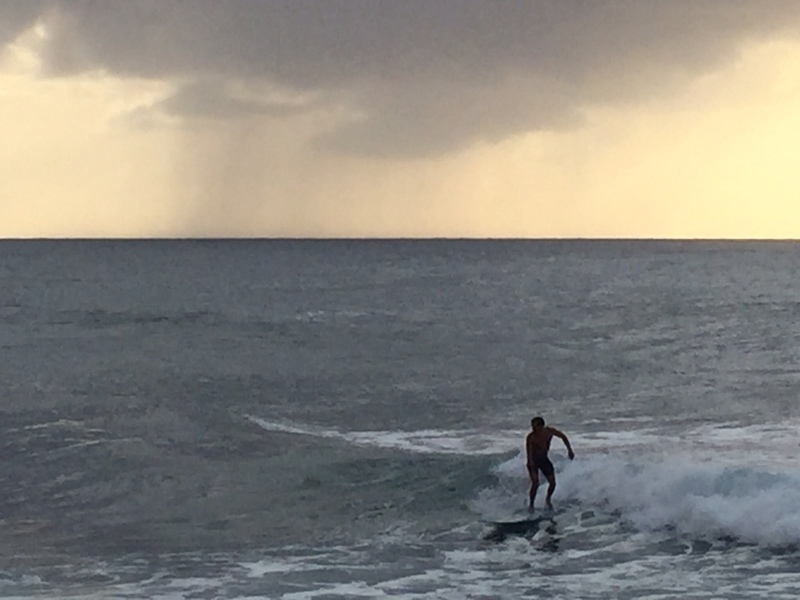 This entry was posted in Animals, Hawaii, horses, Out and about, surfing, The North Shore, Turtle Bay, Waikiki on April 18, 2015 by Amanda Barnier.